Home - The Washington DC Chapter of The ROCKS, Inc.
WATCH VIDEO: "State of the ROCKS - Where we're headed in 2019!" WELCOME TO THE WASHINGTON, D.C. CHAPTER OF THE ROCKS, INC. 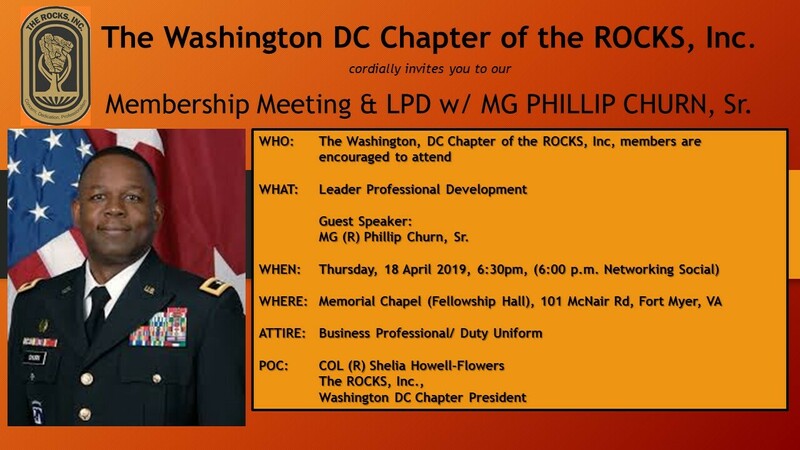 The Washington, D.C. Chapter of The ROCKS, Inc. provides mentorship, scholarship, fellowship, and professional development to National Capital Region Senior ROTC Cadets; all active duty, reserve, and national guard component commissioned officers; and, senior Department of the Army Civilians. Our activities support the missions of the National Board of The ROCKS, Inc., the United States Army and other United States Uniformed Services. We look forward to seeing you at our upcoming events! AmazonSmile donates to the Washington D.C. Chapter of THE ROCKS, Inc. when you shop at smile.amazon.com/ch/52-1382145. The D.C. ROCKS offers a multitude of committees for you to get involved and support the vision and objectives of The ROCKS, Inc. in 2019. The committees require leadership and volunteer support. Interested? Please identify a committee below and contact COL Flowers or LTC Stanley to find out how you can support the D.C. ROCKS today! Asterisk (*) denotes Committee Chair needed. Congratulations to the following members for their hard work and support of the Washington, D.C. Chapter of THE ROCKS, Inc.